Ready For Some Kitchen Art? My first foray into using beets was not pretty. Actually, it was beautiful… but in the wrong way. Let me explain. At the time, Ryan and I were living in the Pacific Beach area of San Diego (where we lived for 7 years). I was interested in learning how to roast beets to replicate our favorite warm beet salad from Alexander’s, a romantic Italian restaurant where we enjoyed date nights. I brought raw beets home and began. First, I cut off and threw the beet greens away. (That was an oops. Hint: those greens are delicious. Keep them!) 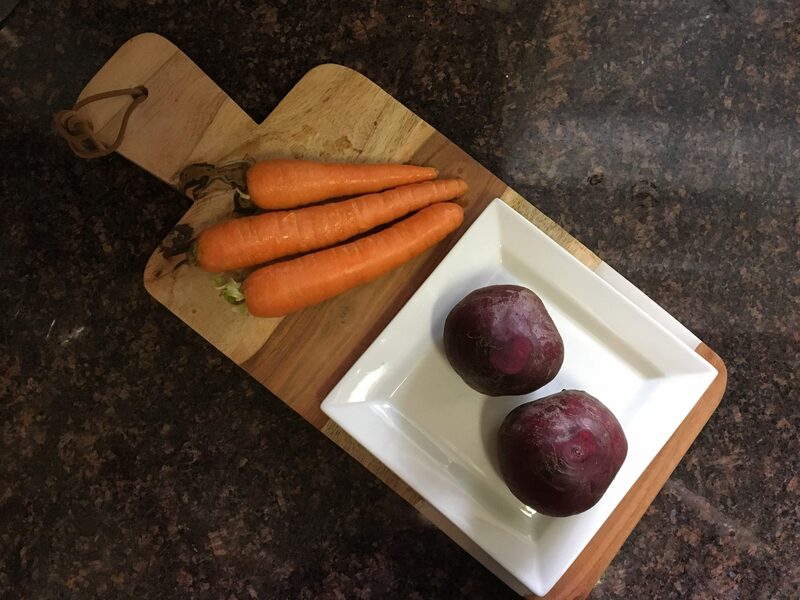 Then, I started peeling the beets willy nilly over a plastic cutting board on top of our white tiled countertop. A few strokes of the peeler later and the most stunning, gorgeous fuschia and white color display was making its way throughout the white kitchen. I quickly changed course and began peeling over our sink… but the spraying of the crazed beet juice mess continued to grow. Fast forward: the salad was delightful. And the cleaning took quite a bit. While the sink and tile wiped up with water, the white grout in between each of those white tiles required some diligence. Now, let’s be fair: the grout was on the older side as this was not a new kitchen. I share that story with you to help illustrate some brief prep that might be helpful. Beets are really delicious (if you haven’t tried them in a while, I encourage you to take another run at them with this recipe). Use an apron or a dark inside-out old college sweatshirt for your beet peeling. Direct the peelings into a trash can or sink. If you have grout that may be susceptible like mine was, lay plastic wrap over it before you start your peeling and it should be just fine. The beet juice usually just requires a rinse to go down the drain–no soap or scrubbing even necessary. Do wear gloves for handling the peeled beets. The pink will stain your fingers for a couple days if you don’t, but you could always share your beet story and experience with others if they ask. Or feign a weekend adventure with finger painting. Have you been having a long, hot summer? Raw salads are delicious to counter the summertime swelter. They have the ability to fortify you with phytonutrients, micronutrients, slow-release sustained energy, and DELICIOUSNESS. This carrot-beet salad, in particular, is so refreshing, hydrating, and light. While carrots and beets in bigger sizes are very crunchy, when you grate them they have a light crisp to them rather than a crunch. The sweetness of the beets and carrots pairs beautifully with the tang of the lemon-dijon dressing. The fullness of the toasted walnuts adds a dose of richness to an otherwise light meal. It’s an intoxicating treat to enjoy regardless of the weather outside. This recipe was inspired by Clotilde at the delightful Chocolate and Zucchini. This FFV adaptation is oil-free, low-salt, and sweet rather than spicy. I just got Clotilde’s The French Market Cookbook and can’t wait to dive into the gorgeous pictures and recipes inside. 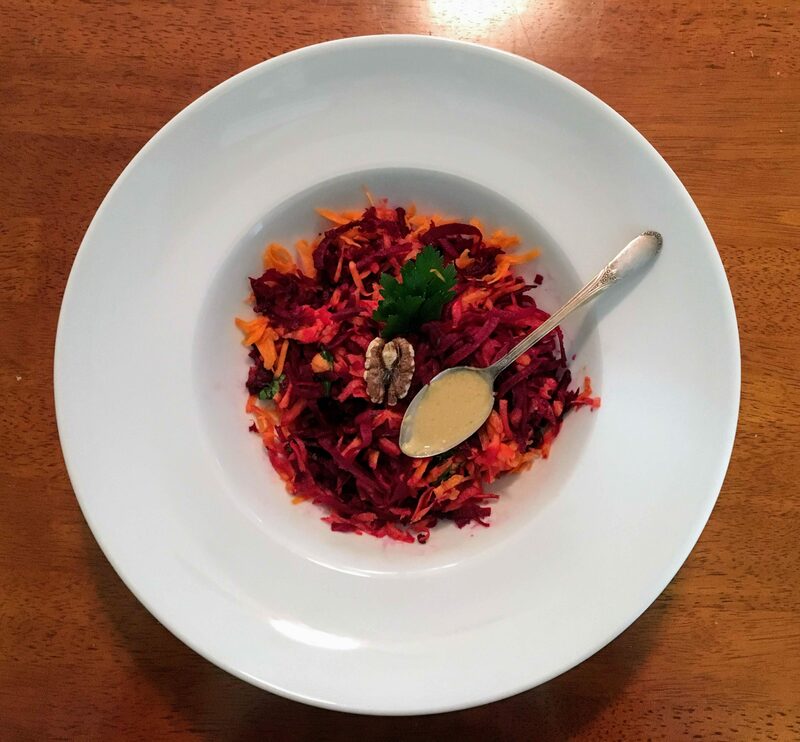 I hope you bring this carrot-beet salad with you to your next outdoor picnic, company event, or just to a dinner with your sweetheart or your favorite podcast out on the balcony. This delicious salad would pair nicely with a green salad (you’ll see one also coming up this week), some cooked greens (hello Brussels sprouts! ), a savory soup, cannellini beans, as well as roasted potatoes or quinoa. This was the first time I used the grater attachment of my Cuisinart food processor. Perhaps you had the same experience as me: did you open your food processor box, see a box with extra parts in it and promptly stash it somewhere? Apparently within that box holds all sorts of wonder! The grater attachment comes in two versions: fine or medium. This recipe was my very first experience using my food processor grater function and was so smooth and fast. I absolutely love my Cuisinart food processor for making amazing finely chopped salads (if you haven’t gone down this route, I’ll do a post on it soon), chopped nuts and nut butters, homemade Larabars, and now, for using the grater and mandoline attachments I just discovered! If you’re looking for an addition to your kitchen, check it out. Carrot-Beet Salad is refreshing, hydrating, and cooling for a summer’s afternoon! Enjoy as a main dish for lunch or add on as a side course for a splash of color on your dinner table. This serves 2 as a main course or 4 as side dishes. Peel the carrots and beets. I recommend you wear a (dark-colored) apron and gloves for the peeling of beets. Grate up your carrots and beets using hand-held grater or food processor. Depending on desired presentation (fully mixed vs. separated on plate), either grate carrots and beets separately or into the same bowl. Whisk in Dijon mustard and water. Reserve half of dressing for table dressing as desired. 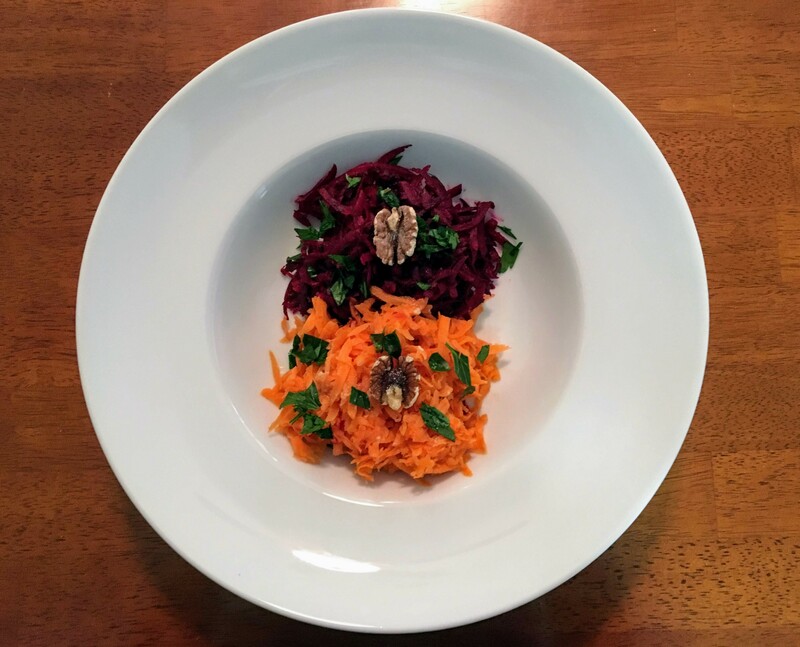 Mix the walnuts into the grated carrots and beets. Mix the dressing on in layers to coat evenly. Serve cold. Will keep in fridge for 4-5 days. I used the medium grater attachment of my food processor.